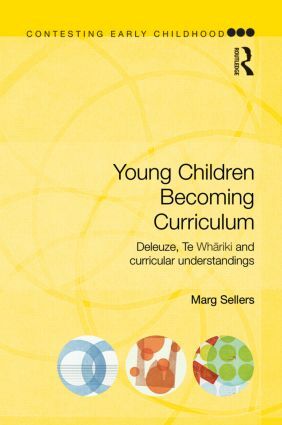 This assemblage of Deleuzo-Guattarian imaginaries generates ways for thinking differently about children’s complex interrelationships with curriculum, and opens possibilities for re(con)ceiving – both reconceiving and receiving – children’s understandings within adult conceptions of how curriculum works for young children. This book will be of interest to early childhood students, scholars and practitioners alike, also appealing to those interested in philosophical, theoretical and practical understandings of curriculum in general. Marg Sellers is a lecturer in undergraduate and postgraduate early childhood teacher education programs in the School of Education at RMIT University, Melbourne, Australia. This groundbreaking new series questions the current dominant discourses surrounding early childhood, and offers instead alternative narratives of an area that is now made up of a multitude of perspectives and debates. The series examines the possibilities and risks arising from the accelerated development of early childhood services and policies, and illustrates how it has become increasingly steeped in regulation and control. Insightfully, this collection of books shows how early childhood services can in fact contribute to ethical and democratic practices. The authors explore new ideas taken from alternative working practices in both the western and developing world, and from other academic disciplines such as developmental psychology. Current theories and best practice are placed in relation to the major processes of political, social, economic, cultural and technological change occurring in the world today.